Unless that’s what the Government wants you to think! You got that “a quick zeroing out of the data is sufficient” from that? It is true, the 35 overwrite passes are quick often superfluous (read, not needed, but is far from not having any effect), but zeroing out is in fact less effective than a few passes of pseudo random data. I’d still opt for a 7 pass erasal algorithm over simply zeroing out the drive. No data is recoverable after being overwritten by a single-pass zero-fill. I work for the largest data recovery company in the world and have spoken to data recovery engineers who have more than twenty years of experience doing nothing but recovering data from all types of media. They have assured me that data which has been overwritten once is unrecoverable. The US DOD standard is a three-pass overwrite not because a single-pass isn’t secure, but because in matters of national security, you can’t be too careful–so why not make triply sure the data is gone! Yeah, sure, but for “the largest data recovery company” is inconsistent with “no data is recoverable after being overwritten by a single-pass zero-fill”. Zero-byte formatting is absolutely not totally safe. Safer than simply formatting? Yes. But data erased this way can still be recovered. The best way to securely erase data short of physically destroying the medium that contains it is to run several random-byte passes on the data or disk. Just because the Gutmann method isn’t the best way to securely delete data doesn’t mean all secure deletion methods are pointless. But data erased this way can still be recovered. Please explain your method for recovering data that has been completely overwritten. Hi Trevor, yes finally Government can still recovery completely overwritten data, by the pattern used for encoding data over the disk ( 2 or 3 or 4 ), they can go throught 7 – 11 levels of overwriting, i usually use “randomZero + UsArmy 3 pass + Gutmann + Schneier + randomZero “, and also in that case with a micromagnetoScope they can recovery ( it can take 1 month for 100 gb ) so i think its ok. Nonsense. The “Government” has no such capability. You’re inventing a boogeyman where none exists. There are many methods like Magnetic force microscopy (MFM) or scanning probe microscopy (SPM) or Magnetic force scanning tunneling microscopy (STM). And take really long time but technology goes on. So do not be naive talking for “boogeyman”. Gus, it’s now July 7, 2013. Would you care to re-think this post? The statement below left by the respondent above is supported by the horses mouth. I was recently deployed to Afghanistan, and was converted to a Gutenite. I read all of his papers and got lost in his website, that all here should check out, but I wrote to Mr. Guttman, and he did backup the below statement. “There are many methods like Magnetic force microscopy (MFM) or scanning probe microscopy (SPM) or Magnetic force scanning tunneling microscopy (STM). I heard a G-man say that they could recover data that had been written over 250 times. And it’s 250 only because that’s as far down as they will look in most cases. 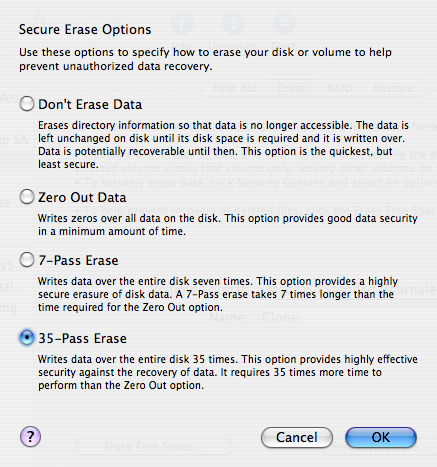 this was very helpful to read seeing as i store very important documents and am looking for a secure way to delete them but please can someone reply with a new updated version to deleting documents i was very confused on whats the bes way to delete data and documents so that it is unrecoverable….. Seriously though – secure data santisation methods discussed above are indeed enough to irretrievably destroy your data from any organisation. Yes, including the imaginary ones most people here seem to be fearful of. The fact that government agencies are intercepting our communications traffic does not correlate to them retrieving data from storage media which has been subjected to advanced data sanitisation methods. i.e. It is a concern but it is not as hopeless as the tin-foil hat brigade would have us believe. I am just curious. Seeing the FBI was able to retrieve the deleted emails of Mrs. Clinton isn’t that proof they have ways beyond the normal retrieval? I would assume the company Mrs. Clinton used would have done a pretty secure job of deleting. If data can be recovered after a single pass then two times more information can be stored on a harddisk. If data can be recovered after a double pass then 3 times more information can be stored on a harddisk and so on. A single pass is sufficient. If the chance that a single bit can be recovered is very high but not 100% the product of chances goes exponentially to zero for large files. i did one day an error and began to dd my usb key with a debian live. hopefully i stopped the process. testdisk helped me to recover most of the files. but i couldn’t get filenames. which, in some cases, are really important (think about achive splitting encrypted: you need to know the order of these archives to get the whole file be decrypted correctly). so, in a word, one pass isn’t sufficient at all and it will never be. add the fact that it was an usb key.